People get confused by the grades of bolts. The different grades can denote any number of different aspects of the fastener, but most of the time the chief component is the hardness of the bolt. 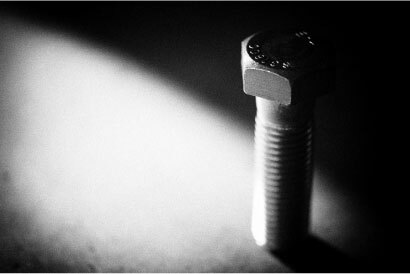 What a lot of people don’t realize is that almost all bolts break down into three classes of hardness. I will attempt to break that down here as it applies to ferrous steel fasteners using layman’s term with the requisite technical jargon thrown in just so you know I know. The three classes are low carbon, medium grade, and case hardened. In the fastener world these roughly break down to SAE J429 grades 2, 5, and 8 respectively. You can think of them as soft, medium and hard as it applies to their proof load, yield and tensile strength. Still confused? Imagine baking a cake. The raw dough is your low carbon or grade 2 bolt. It is a low or medium grade metal that has not been cooked, heat tempered, or quenched in any way. Your medium or grade 5 bolt has been cooked…some. If it were a cake it would have been cooked long enough so that the surface had hardened but not the inside of the cake (bolt). It can be the same type of metal as the previous bolt, only cooked some. The case hardened or through hardened grade 8 bolt has been really cooked. Not only is the outside crispy, but you would be hard pressed to put a fork in it as it has been hardened by heat treatment all the way through. It is made with medium alloy steel. There are hundreds of grades of bolts that we deal with, but nearly all of them fall into one of these three categories. They may have a different chemical composition, head size, thread requirements, etc. but they will all be raw, cooked some, or cooked through.